The CAS decision to ban Guerrero for 14 months, put on hold for the World Cup, could be reimposed in the coming weeks. Guerrero celebrates scoring against Australia last month. PERUVIAN STAR PAOLO Guerrero can play for his Brazilian club Flamengo when it resumes competition this week, despite his suspension for cocaine use, a Swiss court said today. 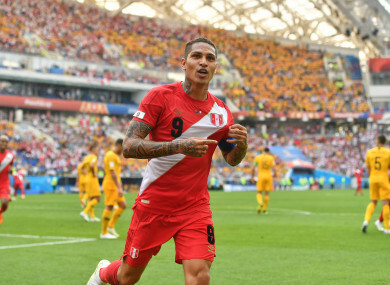 In May, the Swiss Federal Tribunal put a provisional stay on a suspension given to Guerrero by the Lausanne-based Court of Arbitration for Sport (CAS), allowing him to play for Peru at the World Cup. It had not been immediately clear if that stay – considerably aided by a letter of support signed by rival World Cup group C captains Hugo Lloris, Simon Kjaer and Mile Jedinak – applied only to the World Cup, raising concern among Flamengo fans that the club might have to get by without their star. Guerrero, 34, tested positive for traces of cocaine after a World Cup qualifier between Peru and Argentina on October 5. He was initially banned for a year, this was later reduced to six months on appeal last December. However, instead of accepting the ruling, Guerrero appealed to CAS in a bid to clear his name as he claimed the metabolite was present in his body as a result of drinking coca tea. Sport’s top arbitration court responded by increasing the reduced six-month ban to 14 months. CAS secretary general Matthieu Reeb told AFP today that the Swiss tribunal may decide to reimpose the suspension after it receives the full argument in support of the decision reached by CAS judges, which is likely to happen by the end of the month. Email “Peru striker Guerrero cleared to play (for now) despite positive test for 'cocaine'”. Feedback on “Peru striker Guerrero cleared to play (for now) despite positive test for 'cocaine'”.